We have two stand-out Celebrity impersonators that have had massive success as the Master of Ceremonies for your events. I’ll admit writing this, they couldn’t be more polarizing figures, but their shows have been fantastic and very well received. We are talking about The International Man Of Mystery and the 45th U.S. President. That’s right! Celebrity Impersonators, Austin Powers & Donald Trump. I know I have never seen those two names in the same sentence either but for Stage Entertainment they are the two most in-demand corporate MC’s so I wanted to share a bit about these talented celebrity impersonators. Christian & Glenn, Austin Powers and Donald Trump respectively are amazing seasoned professionals. These men are both energetic and as professional actors very confident and crowd focused. Hiring one of these guys as a corporate MC is a fantastic addition to your event or fundraiser. Austin Powers brings a fun, light-hearted and playful excitement to your event while using the characters references and music from the highly successful movie franchise. Donald Trump arguably the most polarizing figure to ever become the President of the United States, brings all the mannerisms and humour surrounding their current president. Call Stage Entertainment to book a corporate Master of Cerimonies for your next event. The mission of Stage Entertainment was always to entertain for your enjoyment. 2019 hasn’t missed a beat. With Santa’s season over for another year, thankfully people are still having birthdays and want to be entertained. Our company is very thankful for the opportunity to work and perform in such a beautiful and vibrant city. Singing Telegrams have brought a lot of joy and fun over the years. You can never go wrong with the classics. Both Marilyn Monroe and Elvis Presley have been mainstays nut we have also moved with the times and have a huge demand for modern performers like Taylor Swift & Ariana Grande. A Chicken singing telegram, a Gorilla singing telegram, a Doctor singing telegram that is always a hit at milestone birthdays, retirement parties, get well wishes and other occasions. We also have many favourite impersonators like Whitney Houston, Donna Summer, Tina Turner, Madonna, Rihanna, Cher and Katie Perry. Hiring a singing telegram has been a fun and memorable way to commemorate an occasion with a song and individual dedication. We love what we do and enjoy the gift of giving something unique and memorable. Long before these telegrams became facebook streams and Instagram videos, these individual performances have brought a smile to the faces of countless recipients. Stage Entertainment has been an enjoyable journey. Afterall it’s hard to call it “work” when you bring so much enjoyment to your customers. Toronto Singing Telegrams is what we are known for, and we are very proud of that fact. Whatever the event a birthday, retirement or corporate events Stage Entertainment can provide you with the perfect performance from our very talented team. Call Stage Entertainment with any questions or to book one of our Singing telegrams now. Iconic doesn’t even begin to cover the incredible contribution to American music and the television era. For most of us, seeing this magical piece of Americana is of the stories of yesteryear. All of the original members have passed on. But they have left a legacy in which we love to pay tribute. The next best thing is an excellent tribute act. Our Toronto based rat pack performance combines singing from all 3 of the most famous rat pack singers. This show consists of many instantly recognizable classics such as King of the Road, My way and New York New York. The show consists of comedy and crowd participation dancing and tremendous vocal performances by Enzo who plays Frank Sinatra, Jeremy who plays Sammy Davis Jr. and Tony who plays Dean Martin. The show will transform your event into a fantastic party atmosphere. Most of us will know the songs and to watch them performed with just comradery and enjoyment makes this a tribute to the rat pack you don’t want to miss. 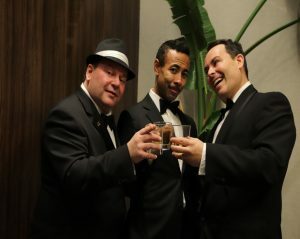 Hiring this Toronto based Rat Pack is a winning choice for your next event. The professionalism, commitment to character, enjoyment and of course the phenomenal skill and overall performance is something to behold. All of the singers are seasoned veterans of the entertainment industry. Inviting the Rat Pack to perform at your event is the perfect addition to your corporate party birthday party and Christmas party. You can get a glimpse of this fantastic performance from a video below. This Rat Pack video was taken last week in Toronto. Fall 2018. When you hold a party, whether it is for your child or for any other reason, you want people to enjoy themselves. It is no wonder then that most people are choosing to hire party entertainers to liven up their events. However, choosing the right entertainer can be quite daunting especially if you are unfamiliar with the market. There are numerous options online and they promise a lot but in reality, if someone you trust did not recommend an entertainer to you or you have not seen them in action, then making that choice becomes a hassle. Here are five things to consider when hiring an entertainer for your party. Most party entertainers work for online-based larger companies. Some of those online agents are in an entirely different state or city from you. An entertainer will often receive calls from remote party agents looking for someone to take on a party in a far off location. Sure, these entertainers can do the job, but the biggest concern is that those remote agents do not really know that entertainer. When you identify a party entertainer of your choice, ensure that you will be getting them and not someone else. Ask to speak directly to the entertainer you have chosen rather than their representative. Experienced entertainers make a whole lot of difference at your party. Find out from them how long they have been in the business and do not shy away from asking for testimonials. The last thing you want is an entertainer who is unsure of what they are doing at your party. Moreover, an experienced performer will give an age appropriate show. Some party entertainers will use the same format on all their shows. This either can be too dull for an older audience or too advanced a younger one. Ask your entertainer exactly what they are going to do at a show and what their package entails. A dependable party entertainer should reach out to you a few days to the party and assure you that they will definitely show up. You should also receive a text message or email confirming the same once you have finalized all the required arrangements with them. Find out which channel of communication your entertainer would rather use. A direct phone number is an ultimate option but if they would, rather you to reach them on their social media page that works as well. You want to be able to reach your entertainer at any time for any reason and especially on the day of the party. You should not always be the one to initiate communication and if they are unreachable most of the time and give flimsy excuses, it would be better to avoid them. Do they have a blue card? Whomever you choose to be the entertainer at your party, ensure that they have a valid blue card that allows them to work with children or an audience of a particular kind. This lets you know that they adhere to laid down regulations and that you can trust them. If your entertainer is unable to present their blue card, it is better to let them go. Are they willing to answer questions? Whatever question comes to mind, feel free to ask your party entertainer. They should always be available to address any concerns or answer any questions you may have before the day of the party so that you are completely confident that everything will go according to plan. Be wary of individuals that claim to be entertainers but are not able to answer simple questions or are unwilling to do so. After all, you are going to pay for their services and you want value for your money. If you get answers for the above questions, you are definitely on the right track to finding the right party entertainer. Theoretically, hiring an entertainer for a corporate event should be a walk in the park. Identify the entertainer, present them with an offer and sign the contract. However, in real life, there is a lot more to booking entertainment than meets the eye and some of the things you may disregard could mean the difference between scrambling to find just anyone to fill the slot and successfully hiring an entertainer. While each, the corporate event is different, there are a few common things that every corporation should look for in an entertainer. The first step towards booking an entertainer for a corporate event is to identify them. The kind of entertainer you choose should match the kind of event you will be holding. There is no faster way to waste money on entertainment than by hiring someone who is not a good fit for the guests at your event. Once you know which entertainer you want for your event, you then have to reach out to their manager or agent. It is important to go for an entertainer who has experience working at corporate events and their agent can provide you with this information. Conversely, you could ask around your corporate circles to get a recommendation. When it comes to hiring entertainment for a corporate event, you need to know what you want your event to look like. It is just like opening a restaurant without a menu in place. An entertainer is less likely to take on a job if they do not know what they should expect. Therefore, if you contact them without a clear picture of what you want them to do; they may ignore your request. Booking entertainment for an event can take various forms so it is important to understand the differences before embarking on the process. For instance, your booking may entail just an appearance by the entertainer where you hire the entertainer to attend the event. This will cost you less but if you want the entertainer to interact with your guests, you will have to pay more. The entertainer you choose should have a strategy in place for whatever you want them to do at your event. If they fail to have one, your event could just as well flop. Once you reach out to an entertainer and they accept your offer, you may think that is all there is to entertainment. That is a very wrong assumption because most of the time, the performance fee for the entertainer is not all you will have to pay. The entertainer’s fee is just a part of the overall cost of entertainment so if you fail to plan well, you may find yourself going over-budget fast. Entertainment fees cover the entertainer showing up at your event and doing what you asked of them. There are things that the entertainer will require during their performance and the entertainer’s fee does not cover them. For instance, you will have to cover their transportation to your event and the setup amenities like sound and lights. After getting in touch with an entertainer, do not be afraid to negotiate the booking fee. If both of you are willing to negotiate to arrive at a common price, you can save many up-front costs. It will be a plus for you if the entertainer of your choice is willing to compromise. An entertainer who is inflexible is likely to be uptight at your event and chances are that your guests will not even enjoy. However, just like with any negotiation, you have to know when to ease off and when to push. Failure to do that and you risk the entertainer not doing your event. It is important not to marry yourself to the idea of a particular entertainer. This way, it is easier to walk away before prices go out of hand.